Mecca or Makkah (Arabic: مكة‎‎ Makkah [ˈmaka]) is a city in the Hejaz region of Saudi Arabia that is also capital of the Makkah Region. The city is located 70 km (43 mi) inland from Jeddah in a narrow valley at a height of 277 m (909 ft) above sea level, and 340 kilometres (210 mi) south of Medina. Its resident population in 2012 was roughly 2 million, although visitors more than triple this number every year during the hajj ("pilgrimage") period held in the twelfth Muslim lunar month of Dhu al-Hijjah. As the birthplace of Muhammad and the site of Muhammad's first revelation of the Quran (specifically, a cave 3 km (2 mi) from Mecca), Mecca is regarded as the holiest city in the religion of Islam and a pilgrimage to it known as the Hajj is obligatory for all able Muslims. Mecca is home to the Kaaba, by majority description Islam's holiest site, as well as being the direction of Muslim prayer. Mecca was long ruled by Muhammad's descendants, the sharifs, acting either as independent rulers or as vassals to larger polities. It was conquered by Ibn Saud in 1925. In its modern period, Mecca has seen tremendous expansion in size and infrastructure, home to structures such as the Abraj Al Bait, also known as the Makkah Royal Clock Tower Hotel, the world's fourth tallest building and the building with the third largest amount of floor area. During this expansion, Mecca has lost some historical structures and archaeological sites, such as the Ajyad Fortress. Today, more than 15 million Muslims visit Mecca annually, including several million during the few days of the Hajj. As a result, Mecca has become one of the most cosmopolitan cities in the Muslim world, even though non-Muslims are prohibited from entering the city. "Mecca" is the familiar form of the English transliteration for the Arabic name of the city, although the official transliteration used by the Saudi government is Makkah, which is closer to the Arabic pronunciation. The word "Mecca" in English has come to be used to refer to any place that draws large numbers of people, and because of this some English speaking Muslims have come to regard the use of this spelling for the city as offensive. The Saudi government adopted Makkah as the official spelling in the 1980s, but is not universally known or used worldwide. The full official name is Makkah al-Mukarramah or Makkatu l-Mukarramah (مكة المكرمة, pronounced [makkah al mukarramah] or [makkatul mukarramah]), which means "Mecca the Honored", but is also loosely translated as "The Holy City of Mecca". The form Bakkah is used for the name Mecca in the Quran in 3:96, while the form Mecca is used in 48:24. In South Arabic, the language in use in the southern portion of the Arabian Peninsula at the time of Muhammad, the b and m were interchangeable. Other references to Mecca in the Quran (6:92, 42:5) call it Umm al-Qurā (أم القرى), meaning "mother of all settlements." Another name of Mecca is Tihamah. Mecca is governed by the Municipality of Mecca, a municipal council of fourteen locally elected members headed by a mayor (called an Al-Amin) appointed by the Saudi government. As of May 2015, the mayor of the city was Dr. Osama bin Fadhel Al-Bar. The early history of Mecca is still largely disputed, as there are no unambiguous references to it in ancient literature prior to the rise of Islam. The Roman Empire took control of part of the Hejaz in 106 AD, ruling cities such as Hegra (now known as Mada'in Saleh), located to the north of Mecca. Even though detailed descriptions were established of Western Arabia by Rome, such as by Procopius, there are no references of a pilgrimage and trading outpost such as Mecca. The first direct mention of Mecca in external literature occurs in 741 AD in the Byzantine-Arab Chronicle, though here the author places it in Mesopotamia rather than the Hejaz. 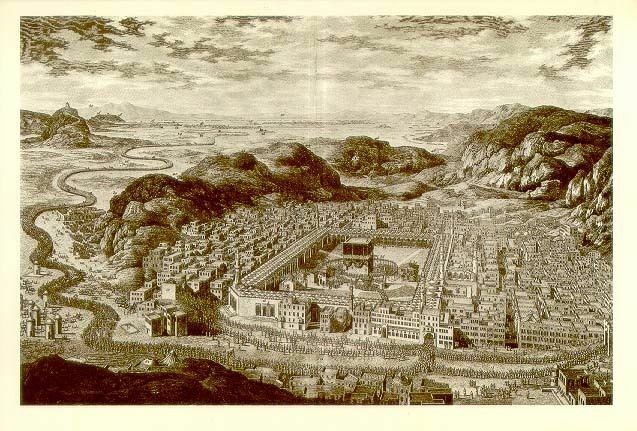 In the Islamic view, the beginnings of Mecca are attributed to Ishmael's descendants. The Old Testament chapter Psalm 84:3–6, and a mention of a pilgrimage at the Valley of Baca, that Muslims see as referring to the mentioning of Mecca as Bakkah in Quran Surah 3:96. Some time in the 5th century, the Kaaba was a place of worship for the deities of Arabia's pagan tribes. Mecca's most important pagan deity was Hubal, which had been placed there by the ruling Quraysh tribe and remained until the 7th century. The Year of the Elephant is the name in Islamic history for the year approximately equating to 570 CE. According to Islamic tradition, it was in this year that Muhammad was born. The name is derived from an event said to have occurred at Mecca. According to early Islamic historians such as Ibn Ishaq, Abraha the Christian ruler of Yemen, which was subject to the Kingdom of Aksum of Ethiopia, built a great church at Sana'a known as al-Qullays in honor of the Aksumite king Negus. It gained widespread fame, even gaining the notice of the Byzantine Empire. Abraha attempted to divert the pilgrimage of Arab people from Kaaba to al-Qullays and appointed a man named Muhammad ibn Khuza'i to Mecca and Tihamah as a king with a message that al-Qullays was both much better than other houses of worship and purer, having not been defiled by the housing of idols. When Muhammad ibn Khuza'i got as far as the land of Kinana, the people of the lowland, knowing what he had come for, sent a man of Hudhayl called ʿUrwa bin Hayyad al-Milasi, who shot him with an arrow, killing him. His brother Qays who was with him fled to Abraha and told him the news, which increased his rage and fury and he swore to raid the Kinana tribe and destroy the temple. Ibn Ishaq further states that one of the men of the Quraysh tribe was angered by this, and going to Sana'a, slipped into the church at night and defiled it; it is widely assumed that they did so by defecating in it. Abraha marched upon the Kaaba with a large army, which included one or more war elephants, intending to demolish it. When news of the advance of Abraha's army came, the Arab tribes of the Quraysh, Banu Kinanah, Banu Khuza'a and Banu Hudhayl united in defense of the Kaaba. A man from the Himyarite Kingdom was sent by Abraha to advise them that Abraha only wished to demolish the Kaaba and if they resisted, they would be crushed. Abdul Muttalib told the Meccans to seek refuge in the hills while he with some leading members of the Quraysh remained within the precincts of the Kaaba. Abraha sent a dispatch inviting Abdul-Muttalib to meet with Abraha and discuss matters. When Abdul-Muttalib left the meeting he was heard saying, "The Owner of this House is its Defender, and I am sure he will save it from the attack of the adversaries and will not dishonor the servants of His House." Abraha attacked Mecca However, the lead elephant, known as Mahmud, is said to have stopped at the boundary around Mecca and refused to enter. It has been theorized that an epidemic such as by smallpox could have caused such a failed invasion of Mecca. The reference to the story in Qur'an is rather short. According to the al-Fil sura, the next day, [as Abraha prepared to enter the city], a dark cloud of small birds sent by Allah appeared. The birds carried small rocks in their beaks, and bombarded the Ethiopian forces and smashed them like "eaten straw". Camel caravans, said to have first been used by Muhammad's great-grandfather, were a major part of Mecca's bustling economy. Alliances were struck between the merchants in Mecca and the local nomadic tribes, who would bring goods – leather, livestock, and metals mined in the local mountains – to Mecca to be loaded on the caravans and carried to cities in Syria and Iraq. Historical accounts also provide some indication that goods from other continents may also have flowed through Mecca. Goods from Africa and the Far East passed through en route to Syria including spices, leather, medicine, cloth, and slaves; in return Mecca received money, weapons, cereals and wine, which in turn were distributed throughout Arabia. The Meccans signed treaties with both the Byzantines and the Bedouins, and negotiated safe passages for caravans, giving them water and pasture rights. Mecca became the center of a loose confederation of client tribes, which included those of the Banu Tamim. Other regional powers such as the Abyssinian, Ghassan, and Lakhm were in decline leaving Meccan trade to be the primary binding force in Arabia in the late 6th century. Some Thamudic inscriptions which were discovered in south Jordan contained names of some individuals such as "Abd Mekkat" which means in English "Servant of Mecca". There were also some other inscriptions which contained personal names such as "Makky" which means "The Meccan", but Jawwad Ali from the University of Baghdad suggested that there's also a probability of a tribe named "Mecca". According to Islamic tradition, the history of Mecca goes back to Abraham (Ibrahim), who built the Kaaba with the help of his elder son Ishmael in around 2000 BCE when the inhabitants of the site then known as Bakkah had fallen away from the original monotheism of Abraham through the influence of the Amalekites. Muhammad was born in Mecca in 570, and thus Islam has been inextricably linked with it ever since. He was born in a minor faction, the Hashemites, of the ruling Quraysh tribe. It was in Mecca, in the nearby mountain cave of Hira on Jabal al-Nour, that, according to Islamic tradition, Muhammad began receiving divine revelations from God through the Archangel Gabriel in 610 AD, and advocated his form of Abrahamic monotheism against Meccan paganism. After enduring persecution from the pagan tribes for 13 years, Muhammad emigrated (see Hijra) in 622 with his companions, the Muhajirun, to Yathrib (later called Medina). The conflict between the Quraysh and the Muslims, however, continued: The two fought in the Battle of Badr, where the Muslims defeated the Quraysh outside Medina; while the Battle of Uhud ended indecisively. Overall, Meccan efforts to annihilate Islam failed and proved to be costly and unsuccessful. During the Battle of the Trench in 627, the combined armies of Arabia were unable to defeat Muhammad's forces. In World War I, the Ottoman Empire was at war with Britain and its allies, having sided with Germany. It had successfully repulsed an attack on Istanbul in the Gallipoli Campaign and on Baghdad in the Siege of Kut. The British agent T. E. Lawrence conspired with the Ottoman governor Hussain bin Ali, the Sharif of Mecca. Hussein bin Ali revolted against the Ottoman Empire from Mecca, and it was the first city captured by his forces in the Battle of Mecca (1916). Sharif's revolt proved a turning point of the war on the eastern front. Sharif Hussein declared a new state, the Kingdom of Hejaz, and declared Mecca as the capital of the new kingdom. On 20 November 1979 two hundred armed Islamist dissidents led by Saudi preacher Juhayman al-Otaibi seized the Grand Mosque. They claimed that the Saudi royal family no longer represented pure Islam and that the Masjid al-Haram (The Sacred Mosque) and the Kaaba, must be held by those of true faith. The rebels seized tens of thousands of pilgrims as hostages and barricaded themselves in the mosque. The siege lasted two weeks, and resulted in several hundred deaths and significant damage to the shrine, especially the Safa-Marwa gallery. Pakistani forces carried out the final assault; they were assisted with weapons, logistics and planning by an elite team of French commandos from the French GIGN commando unit. 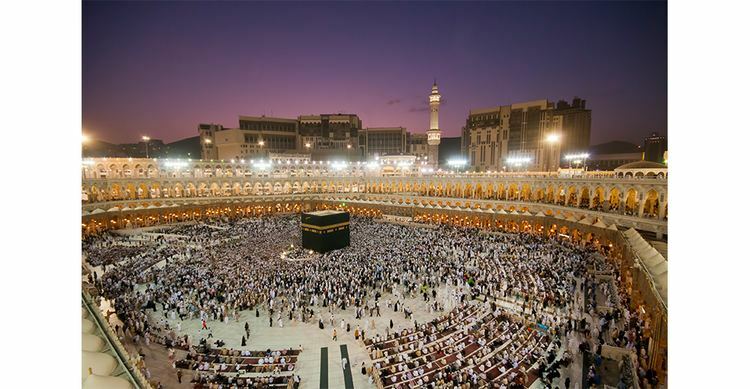 The pilgrimage to Mecca attracts millions of Muslims from all over the world. There are two pilgrimages: the Hajj and the Umrah. The Hajj, the 'greater' pilgrimage is performed annually in Mecca and nearby sites. During the Hajj, several million people of varying nationalities worship in unison. Every adult, healthy Muslim who has the financial and physical capacity to travel to Mecca and can make arrangements for the care of his/her dependents during the trip, must perform the Hajj at least once in a lifetime. Mecca is at an elevation of 277 m (909 ft) above sea level, and approximately 80 km (50 mi) inland from the Red Sea. Central Mecca lies in a corridor between mountains, which is often called the "Hollow of Mecca." The area contains the valley of Al Taneem, the Valley of Bakkah and the valley of Abqar. This mountainous location has defined the contemporary expansion of the city. The city centers on the Masjid al-Haram area, which is lower than most of the city. The area around the mosque is the old city. The main avenues are Al-Mudda'ah and Sūq al-Layl to the north of the mosque, and As-Sūg Assaghīr to the south. As the Saudis expanded the Grand Mosque in the center of the city, hundreds of houses were replaced by wide avenues and city squares. Traditional homes are built of local rock and are generally two to three stories. The total area of Mecca today is over 1,200 km2 (460 sq mi). Mecca features a hot desert climate. Like most Saudi Arabian cities, Mecca retains warm to hot temperatures even in winter, which can range from 18 °C (64 °F) at night to 30 °C (86 °F) in the afternoon. Summer temperatures are extremely hot and break the 40 °C (104 °F) mark in the afternoon dropping to 30 °C (86 °F) in the evening. Rain usually falls in Mecca in small amounts scattered between November and January. The Zamzam Well is home to a celebrated water spring. The Qishla of Mecca was an Ottoman castle facing the Grand Mosque and defending the city from attack. However, the Saudi government removed the structure to give space for hotels and business buildings near to the Grand Mosque. Hira is a cave near Mecca, on the mountain named Jabal Al-Nūr in the Tihamah region of present-day Saudi Arabia. It is notable for being the location where Muhammad received his first revelations from God through the angel Jibreel, also known as Gabriel to Christians. As a result of the vast numbers of pilgrims coming to the city each year, Mecca has become by far the most diverse city in the Muslim world. 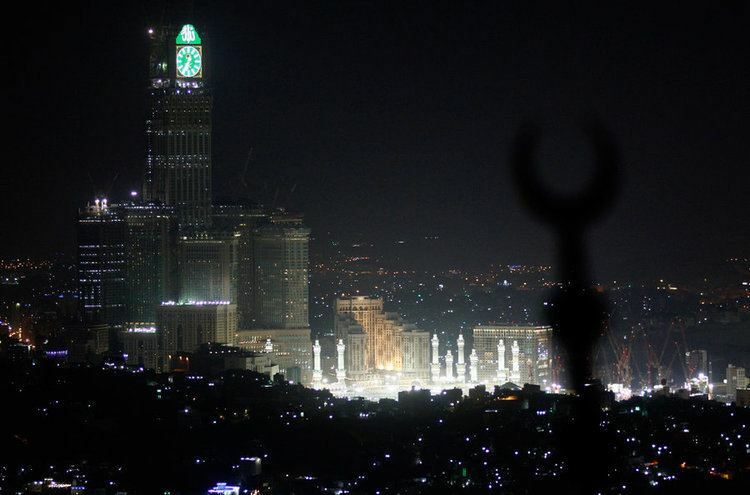 In contrast to the rest of Saudi Arabia, and particularly Najd, Mecca has, according to The New York Times, become "a striking oasis" of free thought and discussion and, also, of "unlikely liberalism" as "Meccans see themselves as a bulwark against the creeping extremism that has overtaken much Islamic debate". As in other Arabian cities Kabsa (a spiced dish of rice and meat) is the most traditional lunch but the Yemeni mandi (a dish of rice and tandoori cooked meat) is also popular. Grilled meat dishes such as shawarma (flat-bread meat sandwich), kofta (meatballs) and kebab are widely sold in Mecca. During Ramadan, fava beans in olive oil and samosas are the most popular dishes and are eaten at dusk. 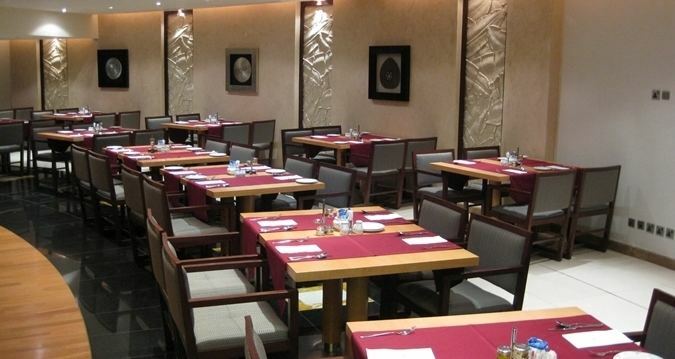 These dishes are almost always found in Lebanese, Syrian, and Turkish restaurants. Non-Muslims are not permitted to enter Mecca under Saudi law, and using fraudulent documents to do so may result in arrest and prosecution. 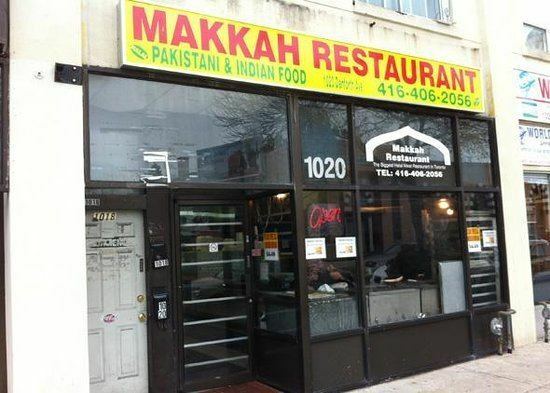 The prohibition extends to Ahmadis, as they are considered non-Muslims. Nevertheless, many non-Muslims and Ahmadis have visited the city. The first such recorded example of non-Muslims is that of Ludovico di Varthema of Bologna in 1503. Guru Nanak Sahib, the founder of Sikhism, visited Mecca in December 1518. One of the most famous was Richard Francis Burton, who traveled as a Qadiriyyah Sufi from Afghanistan in 1853. The Saudi government supports their position using Sura 9:28 from the Qur'an: O ye who believe! Truly the Pagans are unclean; so let them not, after this year of theirs, approach the Sacred Mosque.